Participants as young as five audition each year to join one of our three orchestral ensembles. Our orchestras rehearse on Sundays at Fresno State throughout the academic year. The Youth Chamber Orchestra is our entry-level ensemble. It was traditionally a strings-only group, accepting players of violin, viola, cello, bass, and sometimes harp. But lately we've expanded to include young wind players—flutes and clarinets—as well. We recommend a minimum of one year of private lessons for YCO members, though we are open to all options. It's worth auditioning if you think you are ready. Generally players in this orchestra would be studying the music listed in levels 1 and 2 on this competition website: miltonyoungmusicians. You can check the repertoire listed for each of the instruments listed above. 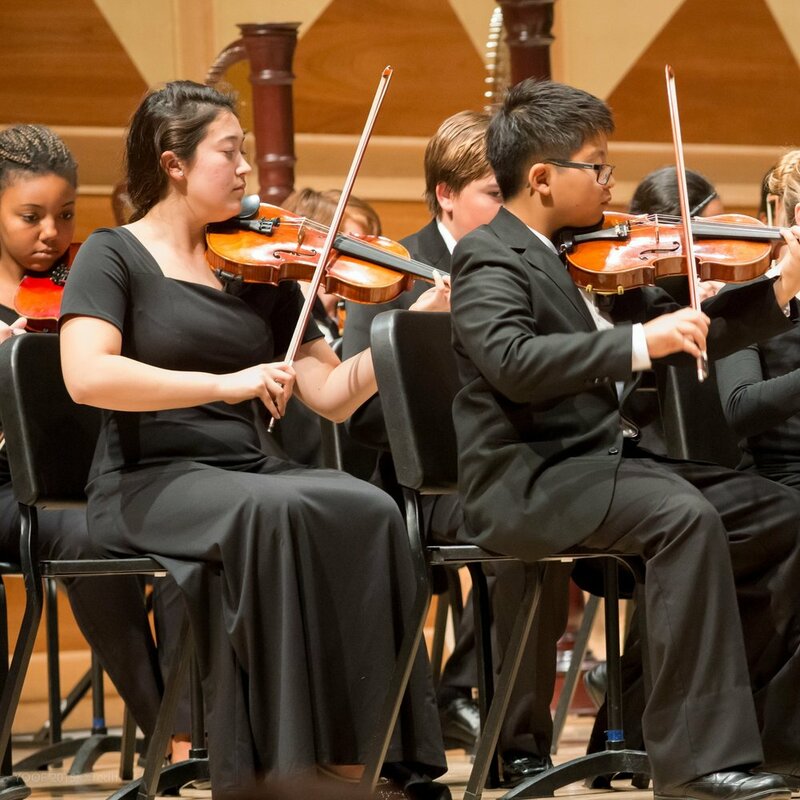 The Youth Symphony Orchestra (YSO) is a full symphonic ensemble that performs challenging orchestral repertoire (not arrangements). Participants range in age from elementary school through senior year in high school. This orchestra includes not just the strings (violin, viola, cello, bass), but also flute, oboe, clarinet, bassoon, French horn, trumpet, trombone, tuba, harp, and percussion. Generally players in this orchestra would be studying the music listed in levels 3 and 4 on this competition website: miltonyoungmusicians. You can check the repertoire listed for each of the instruments listed above. Accommodations can be made for young wind and brass players who want the orchestra experience and can't join the YCO, so go ahead and audition—see what happens! It's worth a try! The Youth Philharmonic Orchestra (YPO) is our premiere ensemble, performing at least three concerts per year of exciting orchestral repertoire. In past years the YPO has performed Stravinsky's Firebird Suite, Prokofiev's Romeo and Juliet, Debussy's La Mer, generous helpings of Bernstein and Gershwin, several Shostakovich symphonies, the Mahler Symphony No. 1, Resphighi's Pines of Rome, Copland's El Salon Mexico, and a huge selection of opera literature, including Humperdinck's Hansel and Gretel...the list goes on and on! Soloists who have performed with the YPO include Vadim Gluzman, violin, Andreas Werz, piano, Daniel Bolshoy, guitar, Csaba Onczay, Philippe Muller, and Emilio Colon, cello, Scott Piper, tenor, Laura Pedersen, soprano...and a host of other amazing musicians.